Location: Andert-et-Condon, in the Ain departement of France (Rhone-Alpes Region). Notes: Château d'Andert is a former stronghold of the fifteenth century, rebuilt in the seventeenth and nineteenth centuries, the center of the lordship of Andert, which stands on the town of Andert-et-Condon in the Ain department region Auvergne-Rhône-Alpes.The castle is the subject of a registration as historical monuments by order of 17 July 1990.Knights of Andert are cited since 1180. The lordship of Andert, with middle and low justice, was first owned by gentlemen of the name, then passes successively to Grammont families, Migieu to Paraz. 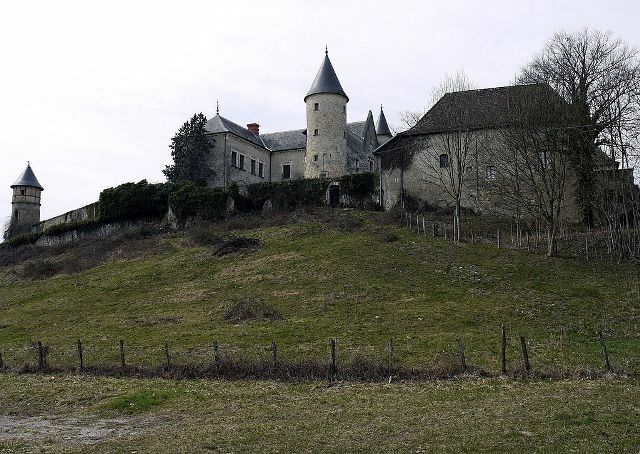 On 3 August 1532, the gentlemen of Grammont, family outcome of Bugey, in the person of Charles and Humbert de Grammont brothers are a division of property they owned in undivided them; possession of the stronghold and the lordship of Andert is attributed to Charles de Grammont. Elie de Grammont, one of his daughters married Guy Balme, esquire, lord of the Serra, son of Philibert de la Balme, Esquire, Lord of Montchalin (Courtenay) in Dauphine and Francoise Aymavigne. This Guy Balme had twelve children, seven boys and five girls. The son married the point, were mostly involved in the disgrace of their father to his hold Castle Lompnes (Hauteville-Lompnes) and have favored the arms of King Henri IV, which he was subject, had their property confiscated by order Senate of Savoy.After the annexation in 1601 of Bresse and Bugey in the crown, girls will break in 1606, the Parliament of Dijon, the judgment of the Senate, and will be handed in possession of their property. Andert having fallen under discussion at the request of their creditors; Guy Migieu, advisor to King and former president to requests from the palace in Dijon, the son of a daughter of the Balme, it was bought by. The stronghold is in the seventeenth century transformed into a holiday home as evidenced by an engraved date of 1655. It is partly rebuilt in the nineteenth century in neo-Gothic style.